At 7 a.m., we left the luxury of the Grand Hotel D’Angkor, and met the Save the Children folks. It was a fairly simple mission – to go up to Anlong Veng and Trapang Prasat, to study the current educational status, and decide on the strategy for the project we were collectively undertaking. The Cambodian government is committed to getting Anlong Veng connected with the rest of the country, so the 120 km road is being widened and buttressed against the rainy season. Right now, about 60 kms of the road are complete, and the remaining 60 kms is the old “cart track”. We heard stories about bulldozers being destroyed by tank mines as the new road is being built. We also heard that both the Save team, and the authorities, were taking security quite seriously. Somewhere along the way we were apparently to be looked after by government troops, hidden in the dense Cambodian forests. In any event, the first stretch of road was easy, although sand got in the way of any trucks that didn’t have four-wheel drive. A friend of ours once said that the greatest threat to equality of the sexes was toilets – and we proved it. The men could just stand by the side of the road (not in the bushes of course, because of the land mines) – but where were the women to go? Ingrid and I were on this trip with Victoria, our 10 year old daughter. 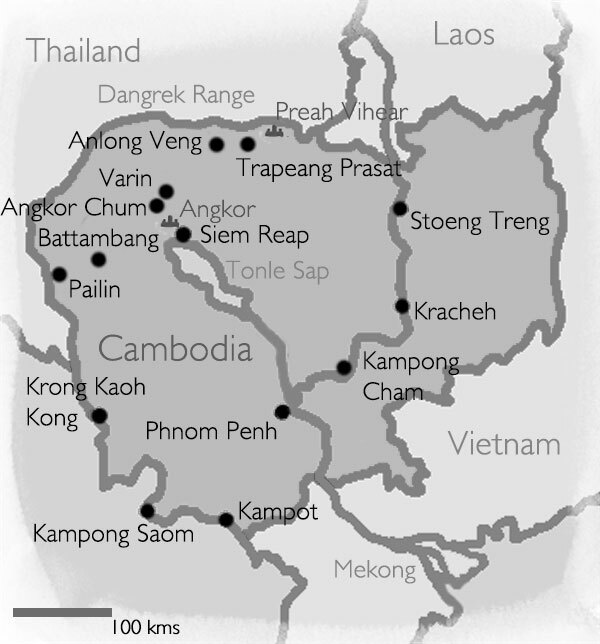 We’d all been in Cambodia before, but none of us had been to the northern districts. Many of our Cambodian companions were also first time visitors to the North. Gunnar, Sarath, Kheang and Nara were from Save the Children. The Provincial Education Office was ably represented by Sereidy, the Pre-Primary Chief, and by Phalla. And, the ever present TV crew was joined by a journalist from the leading national newspaper. These folks probably wanted a story on us, but ended up so entranced by the issues and by the children, that for them this was a journey of discovery, too. Learning as we went along, it seemed the capitalist system was alive and well. The taxi fare from Anlong Veng to Siem Reap is about 13,000 riels (US$3), yet the fare the other way is 20,000 riels. Why? Because in these newly peaceful times, people are going home to their long distant relatives in the North. To set up business, to teach, or simply to go home. When we reached the old road, a couple of things struck us the most. First, except for a few butterflies, we saw or heard no animal for 60 kms. We also probably saw only a half dozen people. Second, we could see the futility of the guerilla war. Decades of fighting, over territory that was unforgiving and unhelpful. No water, and no infrastructure whatsoever. Anlong Veng is at this time of year a dusty town. It took us about 5 hours to make the 120 km trip, with a few stops on the way to ease the aching backs. A small market has grown up there, and a café. We heard that in the time of the Khmer Rouge, women had to go to Thailand to buy saucepans, and then smuggle them home. Now, the spirit of free enterprise is appearing, albeit slowly. The ubiquitous karaoke has also taken root in the café. To our surprise, a picnic lunch had been arranged for us in Ta Mok’s house. Now, this was the man with perhaps the most recent, bloodiest reputation in the Khmer Rouge – only taken into captivity in 1999. Anlong Veng was his last stronghold. It was equally bizarre that we would be sitting on the floor eating sandwiches and rice in the room that Pol Pot, the genocidal leader of the Khmer Rouge, was tried by his peers in 1997. Perhaps entirely fitting were the surroundings of Ta Mok’s villa. He obviously had a thing about water, so artificial lakes were created around the house – aesthetics, or good defense? Yet these lakes killed the trees. The entire site was one of bright sunshine, and death. From Anlong Veng, we drove the 34 kms to Trapang Prasat. The Halo Trust was hard at work clearing land mines at one point. What amazed us was the closeness of the mines to the houses. Families had obviously built where they could, and the mines were less than a stone’s throw from the cooking pots. No wonder children don’t go to school … walking 5 kilometers past mines is not a lot of fun. We heard stories of continued mine accidents and maiming to this day. We stopped on the way at a group of three, grass-roofed huts – one as yet uncompleted. The children had helped build this school, and were hard at work. Whilst we managed to break the ice, the sadness in their eyes will always be with us. Sarath asked one 12 year old (?) what she had learnt in the years gone by. She responded with a rote description of how to cut and set sharp sticks to wound the enemy, and how to plant simple land mines. There was no sense of right or wrong in her description, and no sense of logic – it was just as things are. Her teachers would expect her, as one of the older children, to go to the front lines to plant these weapons. It was clear that a fundamental precept of the project we are embarking on is correct – these children have learned significant life skills, and they must be respected for that. Their future education needs to build from this base. But there is a huge vacuum, both in traditional learning and in social/ethical understanding. One wonders what could happen if these children could leap frog, and jump straight into the Internet era? We need to explore this idea. As we entered Trapeang, we noticed the small clinic. We were welcomed at the District Office, a new building yet with little furniture. The District Governor was also the previous Khmer Rouge commander, Cheat Chum. Save the Children had helped by building a school, and we visited that. Trapang has over 50% of the kids going to school (better than Anlong Veng), if only for a few years, and the economy is becoming rather entrepreneurial. Not too far away as the crow flies, but totally impossible to get to from the Cambodian side (due to mines) is the temple of Preah Vihear. By all accounts the complex is as important as Angkor, if smaller. Perhaps one day Trapang Prasat will be known to the world just as Siem Reap is today .. but that is years away. Walking around the village, we learnt that until 1998 the Khmer Rouge soldiers and their families had largely been “nomadic” for security reasons. So the possibility of setting up a real home and small farm was a true joy. We talked with many of the locals, and couldn’t help noticing that the children, whilst well nourished, had a variety of ailments. The clinic tried to help, and vaccines were available. But some ailments were out of reach. One old soldier told us he had never had his picture taken, so we promised to get a complete set to him and his family. None of the soldiers really even knew the name Pol Pot. Cheat Chum said he had never met Ta Mok, although he did see him drive past a couple of times, he said. Instructions came via a system of radios. Dinner was in Trapeang’s only restaurant – a venture recently opened by a businessman from Siem Reap. Cambodian soups are wonderful, and we knew full well that the hospitality was special, and expensive to the District. As we got to talk to the Governor, and to some extent get to know him, it seemed clear that his heart was very much into providing for his people. At one time he commanded about 1,000 soldiers, yet today he rides around on his moped, and is obviously well regarded by the population. Victoria made the best observation – at breakfast the next day he was told by a young waitress in no uncertain terms to wait for the guests before he could have his morning rice …. not something you’d expect if fear was in the air. Anyway, we are skipping ahead. We set up camp in the District office, and the generator was kept on especially for us. Sleep was difficult, due to the heat, but humor also played its role. At some strange time in the morning, three shadowy figures appeared at the open window frame. Trying to “stay cool”, Ingrid and I decided they were our bodyguard, complete with Kalashnikov rifles. They seemed to be interested in how we slept, but eventually they got bored, and slung their hammocks outside the window. Rising early, it was time to move on. Driving back to Anlong Veng seemed quite quick, but we were still late. Ta Mok had built a two storey school in Anlong, for about 200 children. But there were no books and no furniture. Save the Children had equipped it. Next to the original building, the Cambodian government was building another, one storey structure – the “Hun Sen School”. This was needed, as the school currently had 826 pupils, and is grossly overcrowded. Families and children alike are desperately keen for education. The children had lined up for us, waiting patiently for over an hour – very embarrassing to us, but a sincere mark of appreciation for Save the Children by the kids. The teachers all seemed dedicated, but many were ex Khmer Rouge with little formal education and no teacher training. They were weary. A class was going on inside the school where an “expert” teacher was teaching children, and other teachers were learning and taking copious notes. We all made speeches, and moved on. Downstairs the kids had a play break. Gunnar thought it would be good to hand out some of Save’s magazines – the only “entertainment” reading possible in the school. There was almost a mini-riot, as kids were desperate for the magazines. What a contrast with the developed world of privilege and expectation, multi media and instant communication. We later met with the District Governor of Anlong Veng, and his senior staff. It is fair to say the chemistry between us all did not develop as well as in Trapeang Prasat – too formal, too bureaucratic. We must give it time. So, we needed to get back onto the road – to Siem Reap, home of international tourism and grand hotels. The contrast will never leave us. In fact, a few days later, we were being driven from the Le Royal in Phnom Penh (a wonderful hotel) in an air-conditioned, stretch BMW. Classical music was in the CD player. There was almost no noise coming from outside of the car. But we could see the people, and their daily struggle. We could see the children.